Around 1cm to 3cm of the white stuff is expected to accumulate "quite widely", the Met Office said, with the possibility of 5cm to 10cm falling on higher ground. 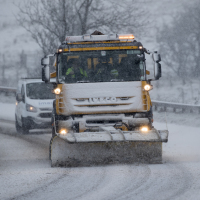 The Met Office warned of possible disruption including delays on roads, stranded vehicles and cancelled rail and air travel. It said there was a "slight chance" rural communities could be cut off and that power cuts may occur. Strong winds It follows a windy weekend that left parts of Wales without electricity on Sunday as overhead cables were felled. Looking to escape to sunnier climes? Check out our varied travel insurance options.